4-CD box (LP-size) with 48-page book, 101 tracks. Playing time approx. 245 mns. Another Bridge To Burn, When The Ship Hit The Sand, Life Turned Her That Way, and When Your House Is Not A Home. The years from 1957 to 1966 also yielded spirited remakes of earlier hits like We Could and Out Behind The Barn, as well as the international pop and country smash hit May The Bird Of Paradise Fly Up Your Nose. 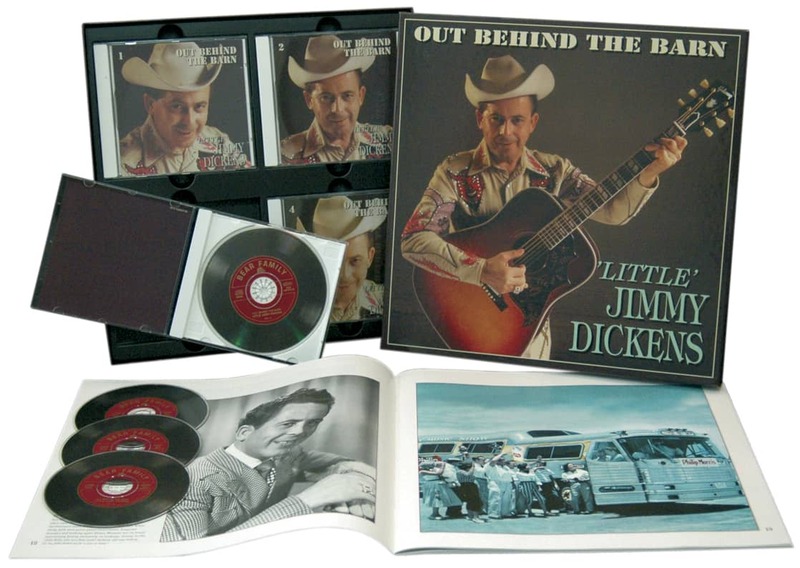 The 44-page book includes many incredible photos from Little Jimmy Dicken’s personal albums as well as his song-by-song recollections and a full, newly-researched biography by WSM announcer Eddie Stubbs. 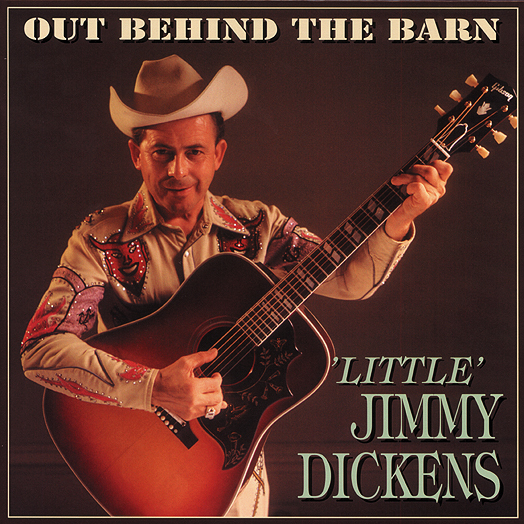 The career of Little Jimmy Dickens has spanned nearly sixty years. From his humble beginnings watching relatives for hours as he tried to learn the rudiments of rhythm guitar, to the ultimate accolade as he was inducted into the Country Music Hall of Fame, Little Jimmy Dickens has seen and done it all. He still vividly recalls his debut on radio crowing like a rooster, his career as a singer on radio--station hopping to different parts of the country, his membership of the world famous Grand Ole Opry, and the fact that he was the first country music entertainer to completely circle the globe on a tour. Along the way, he has earned the admiration of several generations of fans, as well as that of his contemporaries in the industry. Jimmy Dickens began recording for Columbia Records in 1949, and the 104 recordings he made from that point until January 1957 are included in the first part of our retrospective, ‘Country Boy’ (BCD 15848). This release picks up the story, and continues through Jimmy's remaining nine years with Columbia. As this box begins, rock ‘n’ roll was taking the country by storm. Although rock ‘n’ roll hurt country music tremendously, especially its more traditional artists, Dickens wasn't really affected by it any more than his contemporaries. He had approximately twenty years in the business under his belt and had witnessed some hard times before. Fortunately, by 1957 Dickens was enough of an established star in country music to keep him on the road nearly non-stop, in many cases working as many as three hundred days per year. As the years progressed into the 1960s, country music was changing at a fast pace. The music was becoming less country and more pop, with terms like 'The Nashville Sound' and 'Countrypolitan' used to describe a more homogenized art form. In hopes of attracting a larger audience, the fiddle and steel guitar were largely replaced with piano, nylon string acoustic guitar, string sections, and background voices. In light of all that was happening in the industry during the years covered in this collection, Jimmy Dickens did make some compromises to keep up with the times, but in most cases not nearly as many as some of his contemporaries did. The majority of the one hundred titles recorded in this set feature fiddle and steel guitar instrumentation. 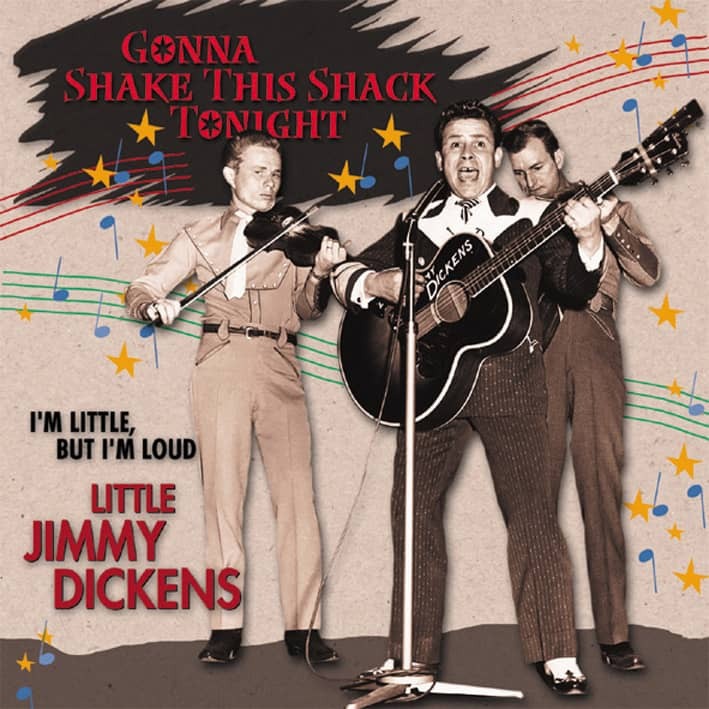 In addition to the trademark Dickens novelties that he initially became famous for, there are lots of 4/4 country shuffles, and numerous heartfelt country ballads--a Dickens specialty. Popular songs for Jimmy, and others from this collection which have been recorded by fellow artists include Family Reunion, (I Got) A Hole In My Pocket, Me And My Big Loud Mouth, When Your House Is Not A Home, I'm Just Blue Enough (To Do Most Anything), Farewell Party, The Violet And A Rose, Another Bridge To Burn, I Leaned Over Backwards For You, Life Turned Her That Way, May The Bird Of Paradise Fly Up Your Nose, My Eyes Are Jealous, and others. James Cecil Dickens was born at home on December 20, 1920, in the small community of Bolt, in Raleigh County, West Virginia. The oldest of a family of thirteen, seven boys and six girls, Jimmy believes his ancestry to be English and Irish. The community of Bolt where Jimmy grew up is eighteen miles west of Beckley, near where the legendary folk hero John Henry lived and worked. In that part of West Virginia, coal mining has been the biggest industry for years. "All my people were coal miners. That's all they knew," remembers Jimmy. "My grandfather Lewis Calvin Dickens and my grandmother Edna Young Dickens took me from a baby and raised me." Growing up, Jimmy also spent a lot of time with his aunts and uncles and remembers his mother being more like an aunt to him. Music was abundant among Dickens' relatives. "My mother played guitar, and three of my mother's brothers, Uncle Quince, Uncle Prince, and Uncle Finley, all played the guitar and thumped around on an old five string banjo a little bit." Radio was also important musically to Jimmy. "My first memories were of the Grand Ole Opry. The Possum Hunters, the Gully Jumpers, Uncle Dave Macon, Arthur Smith and the Delmore Brothers, were the ones that I listened to as a kid growing up in the hills of West Virginia. I must have been about 15 or 16 when I first started really wanting to play the guitar." After intensely watching his relatives play music for hours on end, it wasn't long before Jimmy himself was playing and he won his first talent contest in Pineville, West Virginia. Jimmy attended public schools in Surveyor, West Virginia, about eight miles from Bolt. In spite of his short stature at approximately four feet six or four feet eight, and weighing 85 pounds, he played forward on the basketball team for three years. He was also manager of the football team and was a cheerleader. Jimmy took an active part in school plays and took dramatics for four years in high school. The dramatics classes helped Jimmy learn the valuable skills of stage presence and communication that he would need throughout his career. Jimmy was elected president of his senior class and graduated from Trap Hill High School in 1940. Because of his excellence, he received a scholarship in dramatics to West Virginia University, but turned it down. Jimmy's small stature also brought a job opportunity from Calumet Farms in Louisville, Kentucky to become a jockey, but his grandmother wouldn't allow it. By this time Jimmy Dickens had one thing on his mind, and that was music. He had begun his career a couple of years earlier in 1938 as a performer at WJLS in Beckley where he would crow like a rooster to sign the station on in the mornings. He later joined up with Mel Steele and His Home Folks at the same station where he would sing one song per show. Mel Steele left Beckley and went to WING in Dayton, Ohio and Jimmy quit school to go, but eventually returned home after a few months and went back to school. Returning to WJLS in Beckley while still in school, Jimmy became a featured performer with Johnnie Bailes and the Happy Valley Boys. 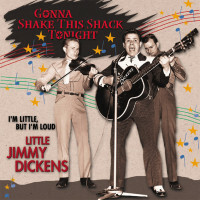 The group also included Johnnie's brother Walter who dubbed Dickens 'Jimmy The Kid'. Another important performer in the troupe was a female vocalist, Dixie Lee, who would later take the stage name of Molly O'Day, and like the Bailes Brothers, achieve eventual fame on Columbia records. Customer evaluation for "Out Behind The Barn (4-CD)"